Wendy Wan-Ki Lee is currently the Professor of theory and composition at the Chinese University of Hong Kong. She received her MM and PhD in theory and composition from the University of Michigan as well as other degrees from the University of Toronto, Royal Conservatory of Music in Toronto, and Trinity College in London. 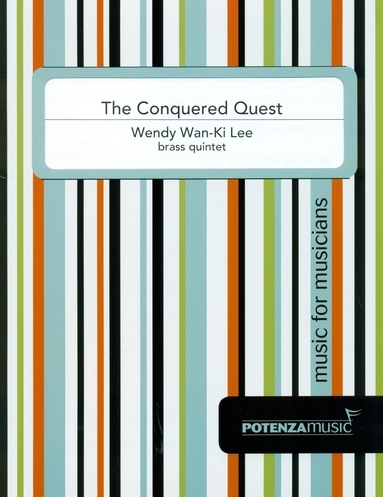 Her bio describes her as “an avid advocate of contemporary works with diverse musical interests.” Furthermore the composer states the following about The Conquered Quest: “I have always been inspired by stories of handicapped athletes who, despite their physical limitations, are able to overcome many challenges and attain their goals. Starting from a musical portrayal of five athletes in a competition, to the kind of emotional turmoil that they will experience along the way, this brass quintet will hopefully serve as a reminder to us that no matter how difficult things might appear to be in the quest of our lives, we would be able to conquer all barriers in the end as long as we are determined to do so.” As the program note suggests, the piece has five sections ranging from the opening quarter note=132 (Anxiously) to quarter note=72 (Calmly, like a chorale). The compositional threads that weave throughout the piece are both rhythmic and harmonic. Rhythmically the composer often uses a layering of duple and triple. This can be triplet eighth notes over eighth notes, triplet half notes over quarter notes, and four bracketed quarter notes over three quarter notes in a 3/4 bar. Harmonically, it is the balance created between the triadic writing in the opening and more chromatic tonality in later sections. My favorite section is the haunting and beautiful 48-measure chorale in the middle of the work. Beginning with block harmonies and adding a horn melody halfway in, this section pleasingly combines the rhythmic and harmonic motives. The composer also employs rests to maximize the textures available with the five instruments. The tuba part does have some notes above the staff, but few other range or technical challenges exist for the college level or professional player. Score and parts are clear and easily readable. I highly recommend this work. It is musically challenging and stimulating to prepare and perform.